21-year old Chechen native Khasan Baysangurov (17-0, 7 KOs), who represents Russia as a pro, is on a verge of his first career title shot. 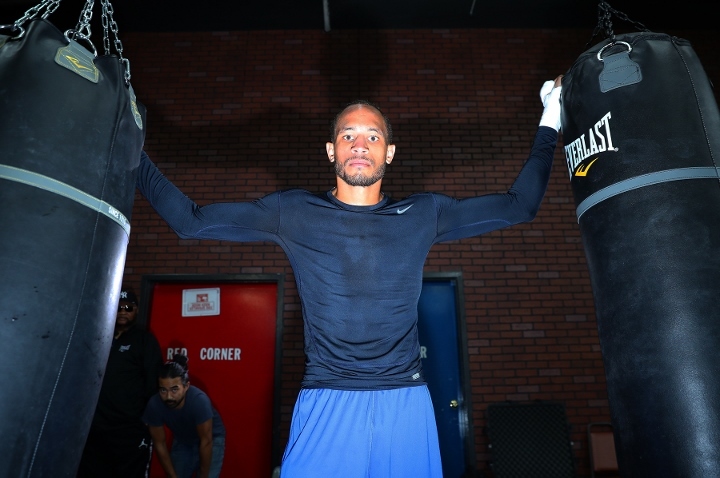 Press outlets had him fighting once-defeated WBA regular middleweight beltholder Rob Brant on February 15 in the States. The fight is confirmed by ESPN to be a headliner of their event, which takes place in Brant’s native states of Minnesota, precisely – at the Grand Casino in Hickney. Brant (24-1, 16 KOs), 28, has previously fought eleven times at the venue, making it his glorious homecoming. The middleweight stylist came back to his usual weight class after an unsuccessful journey to 168 lbs, where he fought and lost to Juergen Braehmer in the first leg of the WBSS inaugural tournament, and sensationally, as well as easily, outsmarted and outboxed Japanese Ryota Murata over twelve one-sided rounds. WBA #8 and WBO #14 Baysangurov is a nephew of former WBO light middleweight champion Zaurbek Baysangurov and is trained by his father Uvais, who has also trained Zaurbek. Khasan started boxing at a tender age of 16, competing mostly in Ukraine but also fighting a couple of time is Moscow. His biggest win came against tough Argentinean Guido Nicolas Pitto on points in May 2018. Mikhail Aloyan (4-1) is still unsure of his prospects this year. Aloyan, who is coming off a close unanimous decision loss to WBO bantamweight champion Zolani Tete in his fifth only professional fight – the fight being part of the first leg of the World Boxing Super Series second season, is still not sure whether he participates in the upcoming World amateur championship and the subsequent Olympic Games in Tokyo or not. “My next fight will probably be in April”, said Aloyan to RIA Novosti. “Whether I participate in the world amateur championship or not will be decided with my team. My next camp starts in Sochi this January. We shall consider the future after it. At least, I’ll train with the [Russian national amateur] team. We shall see after that but don’t ask me when. “We have already done our analysis on a loss [to Tete]”, reflected Aloyan on his first and only pro loss. “I wouldn’t like to rewind it and to see what could have been done. It cannot be done now. Tete won the fight, and I will not put it in doubt by any means. All I wish to say is that it’s very fitting and pleasing that I shared ring with such a fighter and such a champion as Tete. That will motivate me even more”, concluded Aloyan on his title shot. 2019 World Boxing Championship takes place in Ekaterinburg, Russia. Russian national team’s head coach is Eduard Kravtsov, who also trains Aloyan as a pro. According to Umar Kremlev, Russian Boxing Federation’s general secretary, he awaits a number of sound fighters from Russia to have their fight in their Homeland this year. “We are planning several fights of Murat Gassiev, Fedor Chudinov and Artur Beterbiev here in Russia. It’s necessary that our top fighters will compete in front of their fans”, said Kremlev to TASS media agency. Murat Gassiev (26-1, 19 KOs) is a former Super WBA and IBF cruiserweight champion, who is coming off a spirited, yet one-sided loss to Oleksandr Usyk in the WBSS Season 1 Finale. Artur Beterbiev (13-0, 13 KOs) is a reigning IBF light heavyweight champion. Fedor Chudinov (18-2, 12 KOs) is a former WBA super middleweight Super Champion.